The trend of the trouser culoette for spring 2014 is HUGE, the new must have pant was all over fashion week. The high street and desinger market both offer basic/sophisticated or wild, bright pant types. Proenza Schouler is a particular desinger that nailed this trend for me, with the sophisticated and sharp tailored pant. This could be seen again on the high street with Zara selling a similar garment for a fraction of the price. 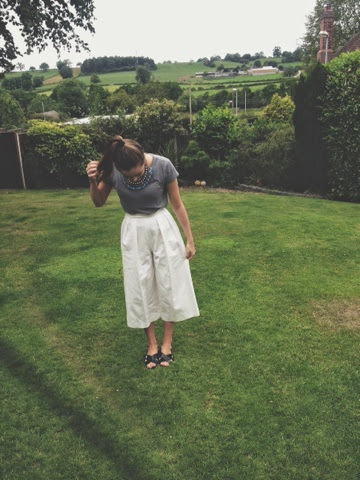 I find a culoette quite hard to pull off with being quite short in height however if matched with pair of strappy heels for the evening this look could be exquisite. Victoria Beckham pulls off a culotte very well with her pointed court shoes, however for a daytime look I thought the culotte worked well with a strappy sandal. 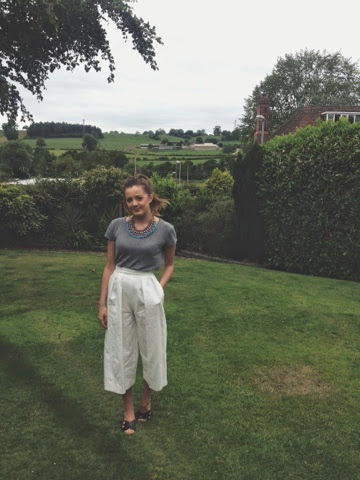 The bright white culoette pant featured today is from Zara brought recently in the sale! They are a pure/bright white colour so I have to be extra careful with them, teamed with a basic grey tee and a statement necklace I peronsally thought this look worked quite well together.